United States Global Research Climate Program - "human activities have increased additional heat - trapping gases"
The causes of climate change can be divided into two categories, human and natural causes. It is now a global concern that the climatic changes occurring today have been speeded up because of man's activities. To understand climate change fully, the causes of climate change must be first identified. Scientists divide the causes into two categories, natural and human causes. The earth’s climate is influenced and changed through natural causes like volcanic eruptions, ocean current, the earth’s orbital changes and solar variations. Volcanic eruptions - When a volcano erupts it throws out large volumes of sulphur dioxide (SO2), water vapour, dust, and ash into the atmosphere. Large volumes of gases and ash can influence climatic patterns for years by increasing planetary reflectivity causing atmospheric cooling. Tiny particles called aerosols are produced by volcanoes. Because they reflect solar energy back into space they have a cooling effect on the world. The greenhouse gas, carbon dioxide is also produced however the CO2 produced is insignificant when compared to emissions created by humans. Ocean current - The oceans are a major component of the climate system. Ocean currents move vast amounts of heat across the planet. Winds push horizontally against the sea surface and drive ocean current patterns. Interactions between the ocean and atmosphere can also produce phenomena such as El Niño which occur every 2 to 6 years. Deep ocean circulation of cold water from the poles towards the equator and movement of warm water from the equator back towards the poles. Without this movement the poles would be colder and the equator warmer. The oceans play an important role in determining the atmospheric concentration of CO2. Changes in ocean circulation may affect the climate through the movement of CO2 into or out of the atmosphere. Earth orbital changes - The earth makes one full orbit around the sun each year. It is tilted at an angle of 23.5° to the perpendicular plane of its orbital path. Changes in the tilt of the earth can lead to small but climatically important changes in the strength of the seasons, more tilt means warmer summers and colder winters; less tilt means cooler summers and milder winters. Slow changes in the Earth’s orbit lead to small but climatically important changes in the strength of the seasons over tens of thousands of years. Climate feedbacks amplify these small changes, thereby producing ice ages. Solar variations - The Sun is the source of energy for the Earth’s climate system. Although the Sun’s energy output appears constant from an everyday point of view, small changes over an extended period of time can lead to climate changes. Some scientists suspect that a portion of the warming in the first half of the 20th century was due to an increase in the output of solar energy. As the sun is the fundamental source of energy that is instrumental in our climate system it would be reasonable to assume that changes in the sun's energy output would cause the climate to change. Scientific studies demonstrate that solar variations have performed a role in past climate changes. For instance a decrease in solar activity was thought to have triggered the Little Ice Age between approximately 1650 and 1850, when Greenland was largely cut off by ice from 1410 to the 1720s and glaciers advanced in the Alps. Current global warming however cannot be explained by solar variations. Some examples are evidenced such as since 1750, the average amount of energy coming from the Sun either remained constant or increased slightly. If global warming was caused by a more active sun, then scientists would expect to see warmer temperatures in all layers of the atmosphere. They have only observed a cooling in the upper atmosphere, a warming at the surface and in the lower parts of the atmosphere. This is due to greenhouse gasses capturing heat in the lower atmosphere. Also climate models that include solar irradiance changes cannot reproduce last century's observed temperature trend without including a rise in greenhouse gases. "It has been demonstrated beyond reasonable doubt that the climate is changing due to man-made greenhouse gases. We are already committed to future substantial change over the next 30 years and change is likely to accelerate over the rest of the 21st century." "The Hadley Centre holds an unique position in the world of climate science. No other single body has a comparable breadth of climate change science and modelling, or has made the same contribution to global climate science and current knowledge." The Industrial Revolution in the 19th century saw the large-scale use of fossil fuels for industrial activities. Fossil fuels such as oil, coal and natural gas supply most of the energy needed to run vehicles, generate electricity for industries and households. The energy sector is responsible for about ¾ of the carbon dioxide emissions, 1/5 of the methane emissions and a large quantity of nitrous oxide. Carbon dioxide is undoubtedly, the most important greenhouse gas in the atmosphere. Changes in land use pattern, deforestation, land clearing, agriculture, and other activities have all led to a rise in the emission of carbon dioxide. Methane is another important greenhouse gas in the atmosphere. It is released from animals such as dairy cows, goats, pigs, buffaloes, camels, horses and sheep Methane is also emitted during the process of oil drilling, coal mining, leaking gas pipelines, landfills and waste dumps. The certainty of global warming can be seen through some of the natural phenomenon like the effect on crops and extreme weather conditions around the world. It is especially clear in the dramatic change of the polar caps, i.e. the Arctic ice cap is shrinking and the Antarctica ice shelf is melting. There other elements of people's homes that contribute to climate change indirectly. Everything, from furniture to computers, from clothes to carpets, all use energy when it is produced and transported – and this causes carbon emissions to be released. Want to learn more on the causes of climate change? Then take a look at the video below. According to the Intergovernmental Panel on Climate Change, the three main causes of the increase in greenhouse gases observed over the past 250 years have been fossil fuels, land use, and agriculture. Agriculture has been shown to produce significant effects on climate change, primarily through the production and release of greenhouse gases such as carbon dioxide, methane, and nitrous oxide. Another contributing cause of climate change is when agriculture alters the Earth's land cover, which can change its ability to absorb or reflect heat and light. Land use change such as deforestation and desertification, together with use of fossil fuels, are the major anthropogenic sources of carbon dioxide. Deforestation by means of cutting down and burning these tropical rainforests usually pave the way for agriculture and industry which often produce even more CO2. Dr. Md. Mizanur Rahman, a biodiversity specialist, (UNO, Mongla, Bagerhat) says, "that climate change and forests are interlinked. The increased destruction of the rainforest forming a precious cooling band around the Earth's equator, is recognised as one of the main causes of climate change. Forests trap and store carbon dioxide, playing a major role in mitigating climate change. On the flip side of the coin, forests become the sources of the greenhouse gas, carbon dioxide when destroyed or over-harvested and burned. Forests , if not harmed ensure that they are enabling to continue to produce the benefits; to mitigate the effects of a changing climate; and to compensate for fossil fuel emissions through carbon storage; and to enhance ecosystem health, sustainability, and resilience. Forests reduce greenhouse gas emissions to combat global warming. 20% of global greenhouse gas emissions result from deforestation and degradation of forest, more than all the world's cars, trucks, ships and planes combined. Fossil fuels release carbon dioxide into the atmosphere contributing to global warming and climate change. Forest alleviates this change by converting carbon dioxide to carbon during photosynthesis. The world's forests contain about 125 percent of the carbon found in the atmosphere. This carbon is stored in the form of wood and vegetation through "carbon sequestration". Trees possess about 20 percent carbon by weight and biomass of forest acts as a "carbon sink." The soil organic matter produced by the decomposition of dead plant material also acts as a carbon store. Consequently forests store enormous amount of carbon: in total, the world's forests and forest soils currently store more than one trillion tons of carbon, twice the amount found floating free in the atmosphere, according to FAO studies. The atmospheric carbon dioxide concentration in the pre-industrial era was 280 ppm. Right now the level has risen to 375 ppm, a 30% increase. It is predicted that the level will be 450 ppm in 2050 resulting in 1.8-3ºC increase in temperature eventually. Therefore, global warming will produce a sharp upswing followed by a deep plunge into a glacial period several thousands years from now. A myriad of potential impacts such as increased cyclone intensity; melting of polar iceberg and glaciers; increased salinity and changes in oceanic currents sea level rise and inundation of low lying cities like Venice, Cairo, New Orleans, Lagos, Amsterdam, etc. ; coral bleaching and mortality of coral reef; colonization of invasive species and species migration; changes in ecosystem; mass extinction; ozone layer depletion; water shortage; and spreading of diseases -- is predicted. " The most recent assessment report from the Intergovernmental Panel on Climate Change (IPCC) says that the earth’s average temperature has risen by 0.74 degrees in the period from 1906 to 2005, and that the average temperature will continue to rise. The greenhouse effect is a natural mechanism that retains the heat emitted from the earth’s surface. The earth’s average temperature is at the moment around 14 degrees celsius (57 degrees fahrenheit). If the natural greenhouse effect did not exist, the average temperature would be around minus 19 degrees celsius (minus 2 degrees fahrenheit). The greenhouse effect is caused by a range of different gases in the earth’s atmosphere. Water vapour makes the most significant contribution to the greenhouse effect, followed by CO2. The atmospheric content of greenhouse gases – in particular CO2 – and the consequences for the climate are being discussed because the content of these gases in the atmosphere has risen precipitously in a period covering approximately the latest 250 years, and especially the last 50. At present the concentration of CO2 in the atmosphere is about 385 ppm (parts per million). Before industrialization it was about 280 ppm. Analyses of air contained in ice from the Antarctic ice cap show that there is far more CO2 in the air today than at any time in the last 650,000 years. The consequence is that the greenhouse effect is becoming stronger, and therefore the earth is becoming warmer. How much warmer has, however, been a matter of dispute. The most recent assessment report from the IPCC is from 2007. It concludes that the earth’s average temperature has risen by 0.74 degrees in the period from 1906 to 2005. The warming is stronger over land areas than over the sea, and accordingly it is strongest in the northern hemisphere. At the same time occurrences of heat waves and violent downpours have also increased, the oceans have risen, and the ice at the world’s poles and on its mountains has begun to melt. All of these effects are predictable in the event of global warming. The IPCC’s most recent assessment report concludes that the average temperature will continue to rise, but that the extent and the duration of this rise, and the severity of its consequences, depend on how quickly and how effectively emissions of greenhouse gases can be restricted and, over time, reduced. Diesel trains in rural Britain are more polluting than 4x4 vehicles. Douglas Alexander, when Transport Secretary, said: “If ten or fewer people travel in a Sprinter [train], it would be less environmentally damaging to give them each a Land Rover Freelander and tell them to drive”. Burning wood for fuel is better for the environment than recycling it, the Department for Environment, Food and Rural Affairs discovered. Trees, regarded as shields against global warming because they absorb carbon, were found by German scientists to be major producers of methane, a much more harmful greenhouse gas. A recent report released by Oxfam International shows that small-scale farmers and pastoralists in Ethiopia are likely to bear the brunt of the negative impacts of climate change in the region, which will include increased poverty, water scarcity, and food insecurity. Farmers, who form the majority of the Ethiopian population, continue to cry foul over inconsistent weather. While Ethiopia has always suffered from great climatic variability, including droughts that have contributed to hunger and even famine in the past, the report details how climate change is set to make the lives of the poorest even harder. During the recent Earth Day celebrations, journalists came face to face with disgruntled farmers who decried the negligence of the international community in mitigating the effects of climate change. Many Ethiopian publications and notably weblogs have highlighted grim stories of disillusioned farmers whose lives are at stake, as a result of global warming. Farmers and pastoralists around the country have shared with journalists the toll that climate change is having on their communities, from ruined crops to dying cattle. A lack of citizen understanding regarding the basics of climate science is an almost universal finding worldwide even though knowledge has increased over time. Especially notable is confusion between causes of climate change and ozone depletion, and confusion between weather and climate. Accurate and complete understanding of information is not a pre-requisite for concern. correlated with the wealth and carbon footprint of a nation. In some studies, more informed respondents reported less concern or sense of responsibility towards climate change. People stop paying attention to global climate change when they realize that there is no easy solution for it. Many people judge as serious only those problems for which they think action can be taken. "Cognitive and Behavioural Challenges in Responding to Climate Change"
The Royal Society acknowledges climate change and the causes continues to be a area of immense scientific research and public debate. The implications of changes in climate are significant to everyone now and for future generations. Humanity depends on the balance of the world's ecosystems. The Royal Society agrees that global warming has occurred over the past 50 years and is largely caused by human activity. What causes climate change is highlighted by human actions such as the the burning of fossil fuels and changes in land use, including agriculture and deforestation. The Royal Society state there is still some uncertainty on the size of future temperature fluctuations and other aspects of climate change however the risks associated with these changes are substantial. The Royal Society's latest report aims to summarise current scientific evidence on climate change and the causes of climate change. The report sets out where the science is established, where there is a wide consensus but continuing debate. The document does not tackle the impacts of climate change but the causes of climate change are considered. US (United States) scientists have revealed Nitrous Oxide better known to the public as laughing gas is very much overlooked when it comes to greenhouse gases. It is believed to be the third most important gas that contributes to global warming. The major study, published in the Proceedings of the National Academy of Science say that climate scientists and the Intergovernmental Panel on Climate Change have not paid enough attention to other causes of climate change but have largely focussed on CO2 as the main contributor. Nitrous Oxide is produced alongside Dinitrogen, a harmless gas, as a by-product of a microbial process working on nitrogen. As human activities such as intensive agriculture and the burning of fossil fuels have hugely increased, therefore so has the concentration of the element in the environment. Generally, research has surrounded the effects of the process of agricultural soils which has been published in over 1,000 studies on this subject. The US study concludes that the occurrence in rivers and streams is responsible for at least 10 per cent of emissions of nitrous oxide caused by human activities. This is three times more than estimated by the IPCC. When compared to CO2, nitrous oxide molecule for molecule, is 300 times more potent when it comes to warming up the earth. Although less is emitted than CO2, so it may be classed as a smaller contributor to climate change, however concentrations in the atmosphere have risen by some 20 per cent (20%) just in the last 100 years. It is increasing by over 0.2 per cent each year. It is also believed to be the leading remaining threat to the Ozone layer. Although it seems less talked about than Climate Change these days, the Ozone layer plays an essential part in protecting the human race and all life on this planet from the sun's highly dangerous ultra violet radiation. Good progress has been made worldwide on eradicating CFC's and HCFC's by phasing them out but could nitrous oxide be the new threat. Dr Henry Gholz, programme director in the National Science Foundation’s Division of Environmental Biology, believes the results of the research are “startling", and “clearly establishes streams and rivers as important sources of nitrous oxide” . They are important because you have to know where a problem originates before you can tackle it. The IPCC's (Intergovernmental Panel on Climate Change) has produced assessment reports on Climate Change in 1990, 1995, 2001 and the latest fourth report "Climate Change 2007 The Physical Science Basis". This fourth assessment report is the most comprehensive and up to date scientific assessment of past, present and climate change in the future. Topic 1 summarises observed changes in climate and their effects on natural and human systems, regardless of their causes. Topic 2 assesses the causes of the observed changes. Topic 3 presents projections of future climate change and related impacts under different scenarios. Topic 4 discusses adaptation and mitigation options over the next few decades and their interactions with sustainable development. Topic 5 assesses the relationship between adaptation and mitigation on a more conceptual basis and takes a longer-term perspective. Topic 6 summarises the major robust findings and remaining key uncertainties in this assessment. This 2007 report is the latest assessment of the IPCC and again will form the standard scientific reference for all those concerned with climate change, its causes and consequences, including students and researchers in environmental science, meteorology, climatology, biology, ecology and atmospheric chemistry, and policymakers in governments and industry worldwide. The IPCC are currently working on a 5th Assessment Climate Change report which is due to be finalised in 2014. The Intergovernmental Panel on Climate Change (IPCC) was jointly established by the World Meteorological Organization (WMO) and the United Nations Environment Programme (UNEP) in 1988. The IPCC’s Fourth Assessment Report (AR4) and latest was released in 2007. It was compiled by contributions from over 3,500 experts from more than 130 countries contributed. It provided over 90,000 review comments from 450 Lead Authors, 800 Contributing Authors, and 2,500 expert reviewers. 2. To provide, on request, scientific/technical/socio-economic advice to the Conference of the Parties (COP) to the United Nations Framework Convention on Climate Change (UNFCCC). From 1990, the IPCC has produced a series of Assessment Reports, Special Reports, Technical Papers, methodologies and other products that have become standard works of reference, widely used by policymakers, scientists and other experts. NASA plays an important part in monitoring the oceans, land, atmosphere, biosphere and cyrosphere. They have at least 14 satellites in orbit around the earth and plan to launch many more in the next few years. The spend by NASA last year on climate science amounted to $1.3 billion and in 2004 the overall climate science budget exceeded all other federal agencies combined. The scientists of NASA have an international presence in the media wordwide as climate experts. They have been helping to identify the causes of climate change and supply information on solar activity, rises in sea levels around the world including the temperature of the oceans. The agency also focuses on air pollution, rises in atmosphere temperatures, they monitor the ozone layer and changes in ice in the sea and land especially at the the poles. In 2007, over 17 space missions also collected data on the climate. NASA also provides funding through sponsorship for field experiments which assist in providing "ground truth" data which is then used to check space instrument performance. Causes in climate change from natural sources such as volcanoes and dust storms and man made sources such as from burning fossil fuels were first globally recorded by NASA's satellites, Terra and Aqua. Using 30 years of satellite solar and atmospheric temperature data greatly assisted the Intergovernmental Panel on Climate Change to reach the conclusion in 2007 that "Most of the observed increase in global average temperatures since the mid-20th century is very likely due to the observed increase in anthropogenic greenhouse gas concentrations." NASA have confirmed that " Earth-orbiting satellites and other technological advances have enabled scientists to see the big picture, collecting many different types of information about our planet and its climate on a global scale. Studying these climate data collected over many years reveal the signals of a changing climate". What if the key factors in the causes of climate change were cows, pigs and chickens? In their published report Robert Goodland and Jeff Anhang believe that the life cycle and supply chain of animals raised for food has been an area greatly underestimated in the production of greenhouse gases. They account for at least half (50%) of human caused greenhouse emissions. They argue if this is true, a better strategy in reversing climate change would be to find better alternatives by replacing livestock with other food sources. This approach would have far more of a rapid effect on greenhouse emissions and their atmospheric concentrations therefore the rate on which the climate is warming and the unnecessary urgency to replace fossil fuels with renewable energy. It is widely accepted that Livestock are known to contribute to greenhouse gases. year of CO2 equivalents (CO2e), or 18 percent of annual worldwide greenhouse gases, are attributable to cattle, buffalo, sheep, goats, camels, horses, pigs, and poultry. With that amount this would easily qualify livestock as an important area for ways to address climate change. Analysis shows that livestock and their by-products actually account or at least 32,564million tons of CO2e per year, or 51 percent of annual worldwide greenhouse emissions. Paul Thagard is Professor of Philosophy at the University of Waterloo and author of The Brain and the Meaning of Life. He explains climate change denial as a result of motivated inference, in which people's beliefs are biased by their goals. He believes it is a good explanation why some politicians and oil company executives ignore the substantial evidence for global warming resulting from human carbon emissions. But a new book provides an alternative explanation that applies very well to denial of climate change problems by ordinary people. Kari Marie Norgaard is an American sociologist who spent a year in a small city in Norway interviewing people about their beliefs and attitudes concerning climate change. Her new book Living in Denial provides a sophisticated account of why a group of people, who are largely well informed and politically progressive, nevertheless tend to deny that climate change is a serious problem. She points to psychological and social processes that are different from Paul's motivated inference explanation. Learn more about causes of climate change denial here. United States Global Research Climate Program - "human activities have increased additional heat-trapping gases"
Human activities have played a significant part in releasing additional heat-trapping gases. This has intensified the natural greenhouse effect and changed the Earth’s climate. The United States Global Research Climate Program report says, a variety of factors influence the climate which are either human-induced or natural. The most important and key factor causing global warming over the past 50 years is the increased build up and concentration of CO2 otherwise known as carbon dioxide. The build up of CO2 in the Earth's atmosphere started during the industrial revolution around the mid 18th century which saw the burning of fossil fuels such as coal, oil, natural gas and the clearing of forests. Trees help to reduce carbon dioxide by absorbing it during the night, producing oxygen during the day. Human activities have helped to increase other greenhouse gases, such as methane, nitrous oxide, and halocarbons 3. These emissions cause thickening of the blanket which trapping gases in the Earth’s atmosphere, causing the surface temperatures to rise. Find out more about human activities and the causes of climate change in the USGRCP report. For hundreds of thousands, to millions of years, the Earth’s temperature and weather patterns change naturally over time. But how is the climate defined? Statistics gathered generally over a period of 30 years are analysed and averaged. The climate can never be static and is subjected to continuous disturbances perhaps occasionally minor in nature and effect but sometimes times much larger. These changes can be gradual and other times abrupt according to The Geological Society. Where does this evidence come from? Evidence for the natural causes of climate change can be found and is preserved in a wide range of geological settings, including marine and lake sediments, ice sheets, fossil corals, stalagmites and fossil tree rings. The advances in field observation, laboratory techniques and numerical modelling allow geoscientists to show, with increasing confidence, how and why climate has changed in the past. For example, cores drilled through the ice sheets yield a record of polar temperatures and atmospheric composition ranging back to 120,000 years in Greenland and 800,000 years in Antarctica. Oceanic sediments preserve a record reaching back tens of millions of years, and older sedimentary rocks extend the record to hundreds of millions of years. This vital baseline of knowledge about the past provides the context for estimating likely changes in the future. Over at least the last 200 million years the fossil and sedimentary record shows that the Earth has undergone many fluctuations in climate, from warmer than the present climate to much colder, on many different timescales. Several warming events can be associated with increases in the greenhouse gas, CO2. There is evidence for sudden major injections of carbon to the atmosphere occurring at 55, 120 and 183 million years ago, perhaps from the sudden breakdown of methane hydrates beneath the seabed. At those times the associated warming would have increased the evaporation of water vapour from the ocean, making CO2 the trigger rather than the sole agent for change. During the Ice Age of the past two and a half million years or so, periodic warming of the Earth through changes in its position in relation to the sun also heated the oceans, releasing both CO2 and water vapour, which amplified the ongoing warming into warm interglacial periods. That process was magnified by the melting of sea ice and land ice, darkening the Earth’s surface and reducing the reflection of the Sun’s energy back into space. The geological record contains an abundant evidence of the ways in which Earth’s climate has changed in the past. That evidence is highly relevant to understanding how it may change in the future. The Geological Society of London founded in 1807 is the UK' national society for geoscience. The oldest geological society in the world. It provides a wide range of professional and scientific support to over 10,000 Fellows (members), about 2000 of whom live overseas. More than 2000 Fellows are also Chartered Geologists. A comprehensive study and analysis has found that Black Carbon, commonly known as soot, has now been elevated to the second most important human contributor to global warming. Black carbon or soot speeds up warming of the atmosphere by heat being absorbed by ultra small particles. These particles in the air darken snow and ice. Although some lighter coloured particles can have a cooling effect because they block sunlight other black carbon sources have a warming effect because they absorb it. Glacier melting and regional weather patterns can be disrupted. Black Carbon is produced by diesel engines and caused through the burning of wood and and coal. The analysis has pushed methane, which comes from landfills and other sources into third place as a human contributor to global warming. Piers Forster a professor at the University of Leeds School of Earth and Environment and one of the soot study’s authors of this and mark study published in the Journal of Geophysical Research-Atmospheres, said in a statement that reducing black carbon can help address rising temperatures. “There are exciting opportunities to cool climate by reducing soot emissions,” Forster added that cutting emissions from diesel engines and domestic wood and coal fires is “a no brainer” because it would improve public health and the climate. Fine particles cause heart and respiratory problems, leading to premature death, as well as asthma and other illnesses. These emission cuts would produce an immediate cooling effect, the authors estimated. Producer Daryl Hannah on 8th March 2013 have released a powerful documentary film about the people and organisations in the United States who cast doubt about the human causes of climate change. It documents an industry that has put profits before people and who have waged a campaign of lies and deceit to bring down the climate science and efforts to combat climate change. Millions of dollars are spent each year by oil and related interests to fund scientists, think tanks and US politicians in a campaign of deceit as highlighted in the film. 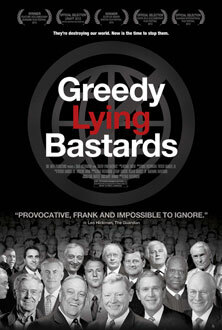 The film Greedy Lying Bastards further focuses on how ExxonMobil has spent over $27 million to squash claims of global warming despite the consensus of the scientific community . The film also claims the Koch brothers operating the conglomerate Koch Industries provided over $67 million of funding between 1997 to 2012. This is a real "must watch" film investigating the reason behind the stalled efforts to tackle climate change in the United States. In 2005 the National Science Academies of 11 nations urged the countries of the world to take immediate and prompt action to reduce the causes of climate change at the 2005 meeting at the Gleneagles G8 Summit. The National Science Academies included Academia Brasiliera de Ciências from Brazil, Royal Society of Canada, Chinese Academy of Sciences, Academié des Sciences from France, Deutsche Akademie der Naturforscher from Germany, Indian National Science Academy, Accademia dei Lincei from Italy, Science Council of Japan, Russian Academy of Sciences, Royal Society from United Kingdom and National Academy of Sciences from United States of America. The Science Academy's statement highlights the need to reduce the causes of climate change as the scientific understanding of climate change is sufficiently clear to justify nations taking prompt action. They believe that countries should identify cost effective steps that they can implement now to make an impact in the reduction of greenhouse gas emissions. The development of economies and nations during the next 25 years energy demand is estimated to increase by 60%. The bulk of carbon dioxide emissions is produced by human activities such as the burning of Fossil fuels. These valuable resources are projected to provide 85% of this demand. It is therefore of paramount importance that every effort is made to minimise the amount of carbon dioxide reaching the atmosphere through cost effective technology. the 21st century and beyond. Not reducing emissions will simply make taking appropriate action harder in the future. "As national science academies, we commit to working with governments to help develop and implement the national and international response to the challenge of climate change. G8 nations have been responsible for much of the past greenhouse gas emissions. As parties to the UNFCCC, G8 nations are committed to showing leadership in addressing climate change and assisting developing nations to meet the challenges of adaptation and mitigation."